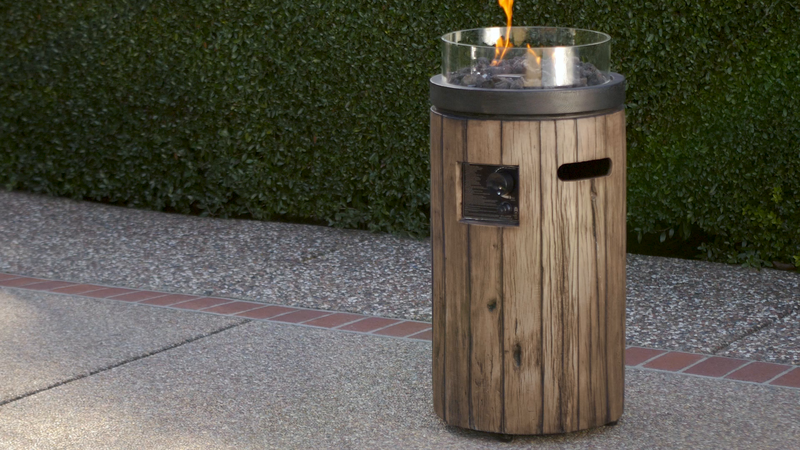 Extend your outdoor living season with this modern Fire Column! Your guests will fall in love with the warmth and comfort this compact fire column provides, as you tell stories, roast marshmallows and relax outdoors. It can easily serve as a focal point on your patio, or you can display several around your yard to create true ambience and balance. This Fire Column is perfect for any outdoor environment! 30k BTU heat output provides warmth and light. Adjust the flame to your desired size with the convenient control knob. Constructed of durable and lightweight Envirostone® for outdoor use. Faux apple wood finish beautifully compliments any patio, deck, or balcony area! Protective cover included to preserve the unit’s integrity. Customer Service Information: Contact Bond toll free at 1.866.771.2663 M-F from 8 am – 4:30 pm PST or email Customer.service@Bondmfg.com. Warranty: This product has a one-year warranty against manufacturing defects in workmanship, or materials.